For real though! Light fixtures are SO important! They can make or break a room. 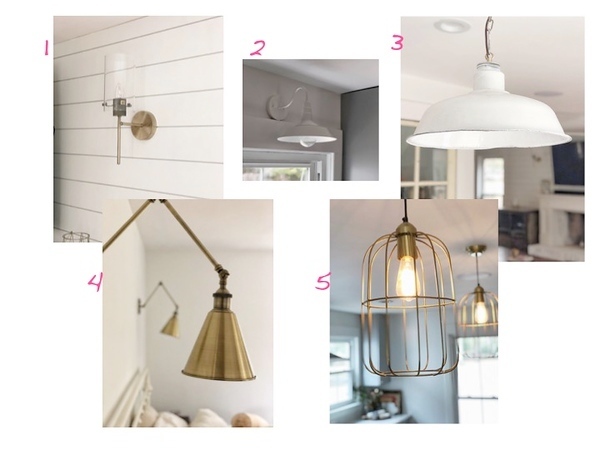 I compiled a list of important steps when planning lighting in your home. Choose a Color Scheme: Think of the coloring you will have throughout the house and what color fixtures will work. You will want the lighting to compliment the door knobs, cabinet pulls, and plumbing fixtures. For instance, my kitchen pulls and light fixtures are brushed gold. My ceiling fans are all white. Our master bedroom & bathroom have brushed gold, yet our guest bathroom has aged bronze, which actually looks great with the gold! Make a Budget: I feel like a broken record with this. But for REAL. As you shop, make a list of what sort of price range you’re finding and what you actually want to spend. You’ll get a feel for what light fixtures cost. Figure out where to splurge and where to hold back. I find spreadsheets super helpful her. Make two columns: Column A has the fixture (with a LINK to it so you can go back and buy), Column B has the price. Keep a running total at the bottom so you see how much $$ you’re looking at! Make a Vision Board: Use Pinterest and Instagram to get ideas for the look you’re going for. You can use that inspiration to help when shopping around. Use Several Sources: I shopped on Amazon, Wayfair, local antique stores, and Target. They were affordable and accomplished the look I was going for! Doesn’t Have to Be Exact: Again, when you find a light fixture you ADORE, but it’s $800, look around for similar options that are less expensive. Ask yourself “what look am I going for” and “what can accomplish that goal within my budget”. I hope this is helpful! I’d love to hear your projects and what sort of color scheme/lighting you’re going with. Details like this are such a fun part of the process!